Clean the carrots and beans. 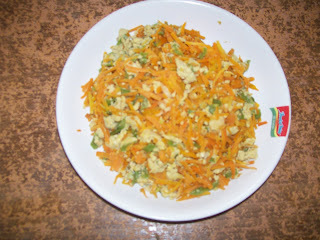 Cut the carrots and beans in tiny pieces. Heat 2 tablespoon of oil, take in garlic, and add carrots and beans. Then take in a few of water, add salt and sugar to taste. Cook in a few minutes, take in the eggs, stir it and cook in a few minutes until there is no water. Orak arik is ready to serve.